You will be given a reference e-book to read which has 580 pages And the test will be based on that e-book , you can take final test within 1 year of purchase. Administrative assistant is known to be such a broad category which designates a person who offers various types of administrative support to groups and individuals who are working in business enterprises. It should be noted that this job title has many variations. The administrative assistant title, itself, refers to those who offer their assistance and support to company teams and departments including accounting, sales and marketing, development, information technology and human resources. It could also refer to executive assistants or secretaries who offer their assistance and services to high-ranking individuals in a company including small executive groups and executives. Those who grab the role of an executive assistant or secretary will be responsible in handling more sensitive or private personal and corporate information. Other roles that can be played by administrative assistants are receptionist, project assistant, personal assistant, clerk, accounting assistant and production assistant. If you plan on becoming an administrative assistant, then it is advisable for you to gather information about your specific duties. These usually include assisting professionals in various essential aspects related to directory maintenance, equipment storage and inventory, logistics and administrative assistance, supplies and assets management inventory, invoices submission, suppliers sourcing and coordinating different operating units and departments as a means of solving the daily operational and administrative problems of a business organization. Administrative assistants are also responsible in business correspondence preparation through spreadsheet or word processing. Brainmeasures administrative assistant certification course is the most suitable online certification course for you if your dream is to enjoy a more flourishing career as a certified administrative assistant. 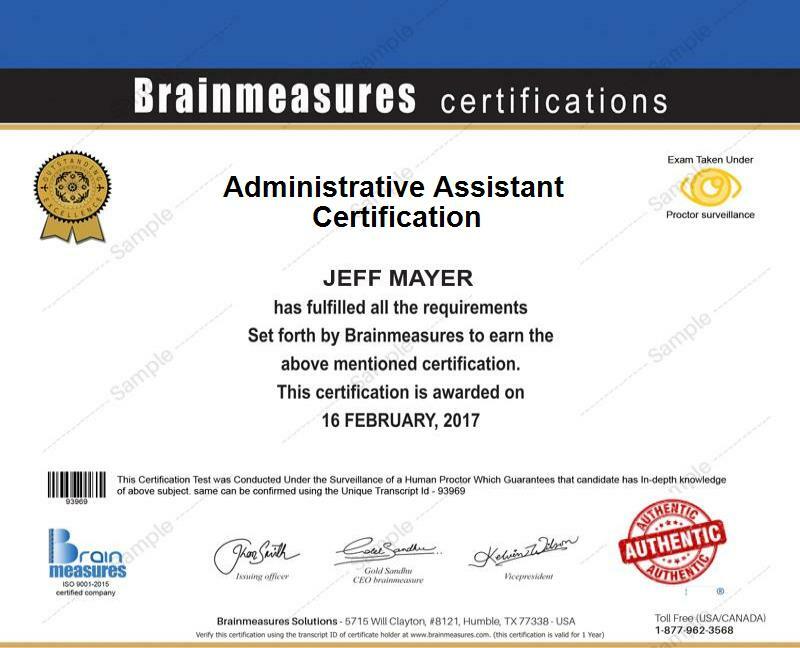 What makes this administrative course from Brainmeasures remarkable is that it is comprehensive and accurate enough that it can cater to the learning needs of all aspiring administrative assistants. Brainmeasures can provide you with a well-developed and detailed administrative assistant training which is guaranteed to help you learn more about the different job titles and descriptions that you can effectively assume as soon as you receive your certificate, the different duties, roles and responsibilities of an administrative assistant and the specific tips and techniques that you can use to become even more effective in this role. Holding an administrative assistant certification is extremely beneficial because it is capable of showing your adeptness in this role. How to effectively screen calls including international long distance calls? How to maintain accurate records? The guaranteed comprehensiveness and highly accurate nature of the Brainmeasures administrative assistant certification course increases an aspiring administrative assistant’s chances of gathering more information about this specific position. It is proven to be really beneficial to all aspiring and present administrative assistants, office administrators, office managers, secretaries, executive assistants and any other success-minded administrative professionals who greatly need to improve their administrative skills. As an administrative assistant certification holder, a more stable salary can also be expected to be offered to you. Using your administrative assistant certification to effectively perform your job as a certified administrative assistant entitles you to receive at least $47,000 every year. You can also use your certificate to work as an executive assistant which allows you to enjoy approximately $45,000 to $93,000 annually.